Programmable Coffee Makers are great gifts at the holidays. It’s cold and chilly, and there’s nothing worse than having to get up in the cold morning and make your own coffee and then wait for it to brew. With Programmable Coffee Makers you set it and go to bed, and when you wake up, you have great coffee. Here is your shopping guide for the best Programmable Coffee Makers. Once you have discovered how easy it is to use programmable coffee makers, you will want to set yours every day to make your cup of coffee. Nobody wants to get up early in the morning while it is cold and have to fiddle about with a coffee maker, so an automatic one is always the better option. Choose between various sizes and styles. The more features you want your programmable coffee maker to have, the higher the price might be, but you can pick up some real bargains if you are just shopping for a simple coffee maker. If you enjoy waking up to a cup of coffee every morning, buying a programmable coffee maker is a fabulous idea. This is the kind of appliance you might never have used before, but once you have got used to it, you will soon wonder how you managed without it! Yes, that is the kind of effect a programmable coffee maker will have on you, especially if you are the kind of person to wake up reluctantly in the morning and find it hard to open your eyes. What is better at waking you up and coaxing you out of your warm bed than the amazing smell of coffee being made? And if you think these machines are expensive, you are in for a pleasant surprise when you realize just how affordable they can be. They come in different colors, well some models do at least, so if you have your heart set on a modern chrome or cute blue one to match your kitchen décor, that will not be a problem. Aside from the aesthetics, you can also choose a programmable coffee maker with the features you personally consider to be important. If you live alone or your partner does not drink coffee, you can get a small machine, or if you prefer a larger model, there are plenty of 12-cup ones on the market as well. In short, there is a programmable coffee maker for every budget, preference, and requirement. We were immediately drawn to this one because it is one of the highest-rated coffee makers online, and reviewers love it. The backlit LCD and cool chrome finish give this one a sophisticated, modern look, while its ability to give 3 brew size options, generous 60-ounce reservoir, and short 15-second water reheating time between brews all mean this is a programmable coffee maker to seriously consider. You can use it with K-Cups, and the one-touch control panel means it is really easy to use. The drip-tray comes out for easy cleanup, and all non-electronic parts are dishwasher-safe. Filtered or distilled water is recommended for use in this machine. You can use tap water, but then it will need to be descaled regularly. The wonderful smell of freshly brewed coffee is a foolproof way to coax you out of your warm bed with something almost resembling a smile on your face. The aroma of coffee is one of the few things that is capable of such a feat for many of us. It is never nice to be woken up by the alarm and then knows you have to get up and go to work, especially if the weather is cold outside and the prospect of staying in bed is a much more tempting one! Coffee will help you wake up, and that first sip is always good. Whether you are a black coffee, an espresso, latte, or even cappuccino drinker, choosing the best coffee maker is important because there are lots to choose from and you need to be sure you pick the best model for your household. Some people will grab a coffee on their way to the office (which is expensive if you do it every day!) while others make their first brew at home. Just as there are many kinds of coffee, there are also various ways to prepare it, ranging from dissolving freeze-dried coffee granules in boiling water, using a single-serve maker or percolator, and investing in an espresso machine, to using a top-end machine to prepare a gourmet brew. Focus on the basic capabilities and design features you want, and then consider features which would be nice to have but are not a deal-breaker. A 12-cup capacity machine might be good if you have a large family but not much use if you live alone and rarely drink coffee. If you often crave hot java or have friends over for coffee regularly, a mid-size machine might be the right choice. Do you want a glass coffee pot that sits on a hotplate or an insulated carafe? Both kinds are available. You might also want to pick something with a water filter because not only does this reduce scale buildup, but it also makes coffee that tastes nicer. Do you want a brew pause function to allow you to make a quick coffee during the brewing process, or a machine that will beep to alert you when the brewing is complete? Some machines will also alert you when they need cleaning or descaling. The more features the machine has, the more it is likely to cost, but look at a programmable coffee maker as an investment because a good one will last years, produce great coffee quickly whenever you want it, and soon become one of your most-used kitchen appliances. Choose from 10 different colors, so this coffee maker fits in with your kitchen dÃ©cor perfectly. The brushed metal is stylish and modern, and there is an adjustable heater plate on the machine which you can have low, medium or high, to ensure your coffee stays at your preferred temperature. The 12-cup carafe features an ergonomic handle for easy, drip-free pouring. You can program this machine up to 24 hours in advance, and it features auto shut-off and 2 filters to ensure your coffee tastes fresh and clean. You get a measuring scoop and instruction booklet with this programmable coffee maker, as well as a 3-year warranty. Reviews like the sturdiness and quality of this coffee maker, as well as how smooth the coffee tastes. This is one of the best programmable coffee makers and was voted as one of 2011′s best products in a leading consumer research magazine. You can lift out the removable filter basket easily, and you can also use the pause and serve feature to pour coffee while the machine is still brewing. There is a cleaning cycle for your convenience, as well as a 2-hour auto shutoff. The price is really good, and if you swap the optional thermal carafe for the glass carafe, the machine detects this and adjusts the hot plate heat. Choose the thermal carafe for 8 cups of coffee or the glass one for 12 cups. 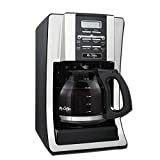 This is a great coffee maker for the price and reviewers love all the features you get for your money. This is a 14-cup programmable coffee maker with a glass carafe. You can make your coffee regular or strong, and the control panel is user-friendly. The water level guide on the outside of the unit appeals to reviewers who say the older models lack this. This is a modern-looking coffee maker which will look great in any kitchen. If you want a cup of coffee mid-brew, just use the brew-pause function, and you can grab a coffee while the machine pauses the brewing process. The carafe has a drip-free spout, another small touch which is important and something you would miss if it were not there. The Gold Tone filter means you can forget about messy paper filters. This is a highly recommended coffee maker which comes with a 3-year warranty and makes a wonderful cup of coffee whenever you want one. The ancient Turks were brewing coffee way back in 575 AD, although of course, they were not using a K-Cup machine to do so! The history of coffee machines is rather vague before 1818 although we can assume there were some very basic models back then, the predecessors to the modern coffee machines. The first drip coffee machine, which was known as a ‘bigging appeared in France in the 1800s, and the first pumping percolator was invented soon afterward by a Parisian metal smith called Laurens. These first machines were large and fiddly to use, but they were popular with coffee lovers during that time. The balance siphon was an interesting coffee machine, and this one resembled a scale. The water would infuse from one side to the other, and a snuffer went over the flame to stop the heat. This meant the water would cool and go back in its original chamber. This vacuum coffee maker was certainly a novel idea at the time although today, of course, it is more of a curio. The electronic coffee machine was developed in the middle of the 1800s, and it allowed consumers to make pots of coffee without having to use the stove. Modern percolators are not that visually different from the original models. Americans in the early 19th century would make coffee by putting ground beans in a pot with water and then bring the mixture to a boil. The resulting coffee would be strained before being served. Some people would put the grounds in an old sock before putting them in the water. In the 1890s the French Press (plunger filter coffee brewer) was invented, and these are still in use today. The coffee grounds go in a filter compartment, then hot water is added, and the coffee grounds can brew. When brewing is complete, you press down the plunger filter, and the coffee grounds are contained in there, so you can pour out the coffee with now sieving or straining required. When you separate the coffee grounds and brewed coffee in this way, the coffee stops brewing too, so it will not become stronger. The first automatic drip coffee maker appeared in 1972, and this Mr. Coffee machine revolutionized the way we prepare coffee. Look at coffee machines today, and you will find hundreds of different ones. In fact, there is a coffee machine for every taste, budget and requirement, so the hardest thing about shopping for one will be choosing which machine to settle on. Once you have worked out which features you want, what size coffee machine is best, and how much you want to spend, you can begin to compare your options and pick out the perfect one. This coffee maker produces delicious coffee, and you can choose from mild, medium or strong coffee. Melitta is a reputable company who knows all about making the best coffee. The water gets nice and hot, not so close to boiling it scalds the coffee grounds but hot enough to give you a nice hot cup of coffee, and the machine is easy to fill, and you will not spill water doing so. It is easy to pour and easy to clean too. A hot cup of coffee is something we all crave especially during the winter months, but this machine can also make ice coffee. Add ice and water to the machine and the results will be a refreshing beverage you can make in just a few minutes. 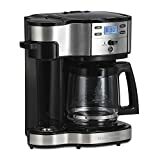 Another highly recommended programmable coffee maker, this Hamilton Beach model is really easy to use and you can either make a whole pot of coffee or just fill the included travel mug before leaving the house in the morning to rush to work. Choose from basic or premium-roast coffee, and ground coffee or coffee pods as you prefer. The built-in clock and timer mean you can program it up to 24 hours in advance, so if you know you have to get out of bed at 7 AM, you can program your coffee to be brewed at the same time your alarm goes off. Then you can really ‘rise and shine’ and face the day ahead. It will automatically turn off after 2 hours of not being used. Switch the lever left or right depending on whether you want to fill the travel mug or the carafe.